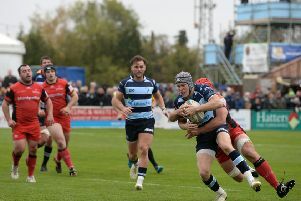 Bedford Blues were unfortunate to lose their final away game of the season on Saturday, a 25-19 defeat at Doncaster Knights. The visitors matched their hosts in the try count, with both sides scoring three apiece but two Dougie Flockhart penalties were the difference between two teams that have been leapfrogging each other in the standings throughout the season. Dean Adamson scored on his return in a Bedford shirt, as well as second half tries from Paul Tupai and Nick Fenton-Wells; but Donny try scorers Latu Makaafi, Lewis Tyson and Matt Challinor meant it was nip and tuck throughout under the South Yorkshire sun. The Blues were forced into two changes inside the opening five minutes as forwards Justin Blanchet and James Currie both looked to have picked up very serious injuries, with the latter requiring a stretcher to leave the field of play. The first half was played at a slow tempo as a result, and because of the two injuries early on, the Blues were forced on to the back foot. The hosts didn’t feel sorry for the visitors, as they were making most of the early running with some good handling allowing them to gain yards. An overlap created by the Knights on the left was missed as Tyson knocked on after the pass to him swayed too far in front of the pacey winger. A number of kickable penalty opportunities were declined by Doncaster as they went to the corner, and on 12 minutes, they were rewarded for that confidence. Their third rolling maul was well defended on the line, but back-row forward Makaafi spotted a chance down the blindside that he went for, and shoved himself over the line. Flockhart’s conversion curled inside the far upright and Donny were 7-0 ahead. Bedford still looked like they were re-organising themselves from those two early injuries and they were unable to get their hands on the ball for a few phases, another Flockhart penalty later in the half stretched the Knights’ lead to 10. However just before the break, the Blues’ exciting backline showed just what they were capable of. A turnover in the midfield allowed the Bedford midfield to shift the ball from right to left, the on-rushing full-back Steffan Jones spotted that no one was at home for Doncaster. The Welshman dually grubber kicked behind and with the pitch very dry, the ball bounced up kindly for Adamson who crashed over to score on his first start for the Blues in over two months. Jake Sharp converted, and Bedford were trailing by just three points as they entered the sheds at the break. Yet the second half didn’t start as planned for Mike Rayer’s side, with the hosts crashing over the line after a few minutes. Despite their scrum going backwards, Knights managed to get the ball out of the set-piece before moving it left. This time Tyson was able to capitalise on an overlap on his wing, and score the five pointer after referee David Proctor consulted his touch judge. Bedford clearly spoke about increasing the tempo after the break, and the sizeable Knights pack began to struggle as they got shifted all over the field. That weariness told on 53 minutes as Paul Tupai, the man who come on for Blanchet after three minutes, was on hand to score his 14th try of this season. A strong nudge by the Blues pack allowed the Samoan to fall over the whitewash with the ball in his hands, and after Sharp’s second successful kick, it was a one point game. Bedford were much better early in the second period but it seemed their momentum slowed down a little as on the hour mark, the match became stop start again with all the replacements happening. Donny began to win penalties and control territory again and a second Flockhart penalty after 65 minutes stretched their lead to four before they were back in Bedford’s 22 not long after. Saracens loanee Hayden Thompson-Stringer was sin-binned for the Blues as he brought down a rolling maul that was destined for the line. Doncaster made their numerical advantage count as the following maul was defended well, but a series of pick and goes on the line ended in Matt Challinor dotting the ball on the line. Flockhart’s impressive kicking continued as the lead was 25-14 with eight minutes to go. The visitors began to increase the tempo again with a number of tap and go penalties, and this created a huge overlap on the left wing that was capitalised by Fenton-Wells as the South-African scoring to create a nervy finish for the home fans. However that score was to prove to be just a consolation as Bedford, despite their valiant efforts, were unable to record their second consecutive win against a well organised Doncaster Knights side. Doncaster: Tom Davies (Jack Bergmanas 72), Harry Thacker (Ben Hunter 53), WillGriff John (Colin Quigley 53), Matt Challinor, Tyler Hotson, Latu Makaafi (Phil Eggleshaw 55), Michael Hills (c), Ollie Stedman, Brad Field (Tomasi Palu 67), Ume Fosita (Paul Roberts 72), Tyson Lewis, Bevon Armitage, Mat Clark, Dougie Flockhart, Paul Jarvis. T: Latu Makaafi, Lewis Tyson, Matthew Challinor. C: Dougie Flockhart x2. P: Dougie Flockhart x2. Replacements not used: Will Foden. Bedford: Camilo Parilli-Ocampo (Tom Williams 66), Charlie Clare (TJ Harris 58), James Currie (Phil Boulton 4), Mike Howard, Harry Wells, Justin Blanchet (Paul Tupai 3), Nick Fenton-Wells (c), Hayden Thompson-Stringer; Luke Baldwin (Darryl Veenendaal 63), Jake Sharp (Baden Kerr 63), Dean Adamson, Mike Le Bourgeois, Henry Staff (Ollie Dodge 52), Pat Tapley, Steffan Jones. T: Dean Adamson, Paul Tupai, Nick Fenton-Wells. C: Jake Sharp x2. Assistant Referees: Chris Sharp and Wayne Falla.